Krill (Euphausia superba) are small red-colored crustaceans, similar to shrimp. 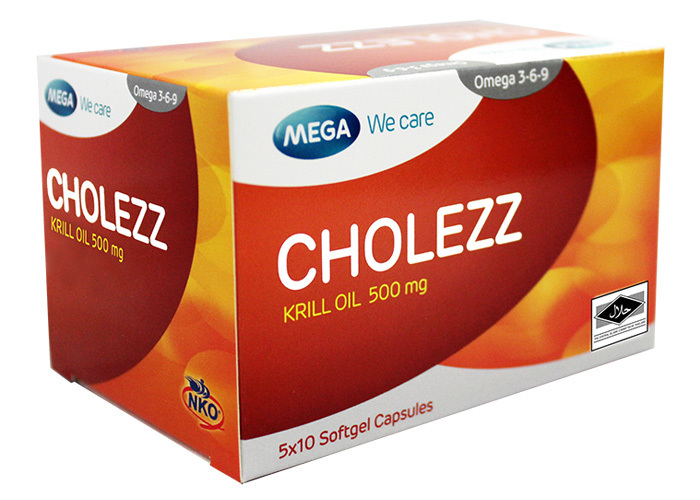 Krill oil is composed of 40% phospholipid (primarily phosphatidylcholine), 30% omega-3 fatty acids (Eicosapentaenoilc acid (EPA) and Docosahexaenoic acid (DHA), astaxanthin, omega-6 fatty acids, omega-9 fatty acids and others. Omega-3, Omega-6 are essential PUFAs (these fatty acids cannot synthesized by body itself), which are important for cardiovascular health and anti-inflammatory system. Omega-9 is a conditionally essential FAs. Omega-9 is mainly used when there is insufficiency of either omega-3, omega-6 or both. Oleic acid; MUFAs can lower cholesterol level. Oleic acid with EPA and DHA showed benefit in improving cardiovascular risk profile.